Life science marketing resources are a big part of Comprendia’s mission to create original content and materials which will help you promote your biotechnology products and improve your positioning in the life science market. Check out the links below and contact us if you’d like us to compile additional resources–we’re always looking for new blog post ideas! Every year we put together a life science marketing planning guide and event calendar to help you map out the conferences and your media placements. We have ongoing relationships with both traditional and new media providers, let us know if you need help pitching a story or getting a good deal on an advertising package. If you’re looking for feedback about your scientific marketing strategy, we also offer a free consultation. We’ll consider your goals and review your efforts and provide some initial guidance on how you can achieve them. We update our life science marketing blog frequently with tips and tools, and you can subscribe for weekly (RSS email) or monthly (Newsletter) updates. See below for easy ways to access important topics in our blog. Tag Cloud: Click on a word to see all related blog posts. We are big proponents of life science social media and use it to share information and engage with both researchers and companies. Follow us and let us know how we can help you using these tools. 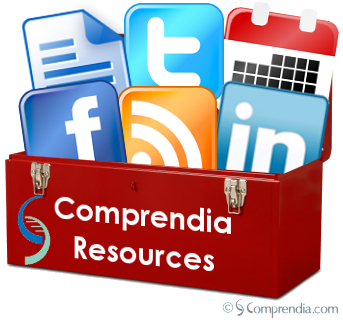 Twitter: Daily updates from Comprendia founder Mary Canady: news, trends, and advice from digital influencers. Facebook: Get updates while checking up on friends and family, and learn how life science companies are using Facebook and other digital marketing. Subscribe to the life science company Facebook interest group to get updates. LinkedIn: Check out our company page and link to our team members. Pinterest: Image-based marketing ideas and trends. Storify: Collections of links from the web and Twitter. SlideShare: Presentations about networking, marketing, and social media, some with audio. In 2008 we founded the SDBN, which is a networking group that utilizes both online and face-to-face networking to help San Diego life science professionals build their networks and share information more freely. The group exists on LinkedIn and also has popular monthly meetings in which we learn about the needs of biotech researchers and professionals. In addition, the website posts San Diego Biotech News, Jobs, a directory of more than 400 companies, and a calendar of local events. Check out the media kit to see how you can leverage this great resource and easily reach 10,000 researchers and professionals. We established this LinkedIn group to provide a forum for marketing, business development, and sales professionals to discuss the commercialization of biotechnology products. The group has grown to more than 3,500 members and is a resource for news, discussions, jobs, and connections for those involved in life sciences marketing.